Former "Tonight Show" host Jay Leno drives back to TV with a brand new show on CNBC, "Jay Leno's Garage. Soon CNBC viewers will be able to pull into "Jay Leno's Garage." Former "Tonight Show" host Jay Leno will be returning to TV in 2015 with a new show on CNBC based on his Emmy-Award winning Web series, "Jay Leno's Garage," the network announced Wednesday. The prime-time series will take viewers on a tour of Leno's extensive classic car collection while also going over the car collector market and restoration projects, along with speeding through fun road tests. This will be the first time that Leno has been on TV since turning over "The Tonight Show" to Jimmy Fallon last year, as well as his first foray into prime-time television since 2009's "The Jay Leno Show." The series will be a bit different than the current "throw tools at each other" template of car shows, Leno told "Access Hollywood." Instead, it will focus on the love affair with automobiles. 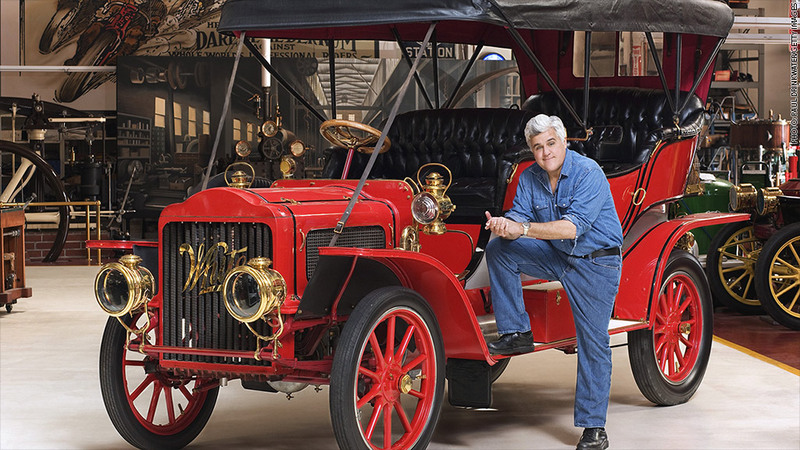 "We hope to highlight the passion and the stories behind the men and women who made the automobile the greatest invention of the 20th century," Leno said in a statement. Last August, the network test drove the idea with "Jay Leno's Garage: The Ultimate Car Week." The special, which took place over Labor Day weekend, was a huge success -- more than tripling CNBC's audience from the year prior with 416,000 viewers. Much like fellow comedian Jerry Seinfeld's "Comedians in Cars Getting Coffee," Leno has found success with a Web-based automobile series collecting more than 1 million subscribers on YouTube. Related: See the cars in "Comedians in Cars..."
For Leno, who was a late-night ratings powerhouse for NBC for decades, the new series allows for the host to drive back to TV while also being able to showcase ordinary people. "I always enjoy observing show business," Leno told "Today." "Then I come back to my garage and meet with normal people, and it's a lot more fun."